While decisions about establishing, maintaining or expanding a peacekeeping operation are taken by the Security Council, the financing of UN Peacekeeping operations is the collective responsibility of all UN Member States. Every Member State is legally obligated to pay their respective share towards peacekeeping. This is in accordance with the provisions of Article 17 of the Charter of the United Nations. The General Assembly apportions peacekeeping expenses based on a special scale of assessments under a complex formula that Member States themselves have established. This formula takes into account, among other things, the relative economic wealth of Member States, with the five permanent members of the Security Council required to pay a larger share because of their special responsibility for the maintenance of international peace and security. The General Assembly reaffirmed these and other general principles underlying the financing of peacekeeping operations in resolution A/RES/55/235 (23 December 2000). More on how UN Peacekeeping is financed. See the scale of assessments applicable to UN peacekeeping operations in the selected General Assembly documents. How much does peacekeeping cost? This amount finances 12 of the 14 United Nations peacekeeping missions, supports logistics for the African Union Mission in Somalia (AMISOM), and provides support, technology and logistics to all peace operations through global service centres in Brindisi (Italy) and Valencia (Spain) and a regional service centre in Entebbe (Uganda). The remaining two peacekeeping missions, the UN Truce Supervision Organisation (UNTSO) and the UN Military Observer Group in India and Pakistan (UNMOGIP), are financed through the UN regular budget. By way of comparison, this is less than half of one per cent of world military expenditures (estimated at $1,747 billion in 2013). Many countries have also voluntarily made additional resources available to support UN Peacekeeping efforts on a non-reimbursable basis in the form of transportation, supplies, personnel and financial contributions above and beyond their assessed share of peacekeeping costs. 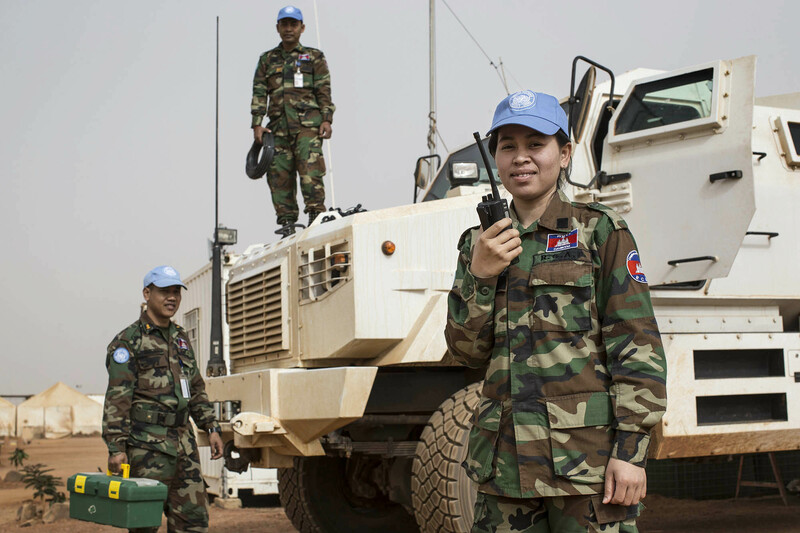 Approved resources for peacekeeping operations in selected General Assembly documents. Budgets of peacekeeping operations are based on the missions’ mandate from the Security Council. As such, they are strategic documents aligning resources to achieve the overall objectives of the operation. Each peacekeeping operation has its own budget and account which includes operational costs such as transport and logistics and staff costs such as salaries. The peacekeeping budget cycle runs from 1 July to 30 June. This cycle is rarely aligned with the Security Council mandate; however budgets are prepared for 12 months based on of the most current mandate of the operation. The Secretary-General submits budget proposal to the Advisory Committee on Administrative and Budgetary Questions (ACABQ). The ACABQ reviews the proposal and makes recommendations to the General Assembly’s Fifth Committee for its review and approval. Ultimately, the budget is endorsed by the General Assembly as a whole. At the end of the financial cycle, each peacekeeping operation prepares and submits a performance report which shows the actual use of resources. This report is also considered and approved by the General Assembly. More on the process of establishing peacekeeping operation budget. The UN has no military forces of its own, and Member States provide, on a voluntary basis, the military and police personnel required for each peacekeeping operation. Peacekeeping soldiers are paid by their own Governments according to their own national rank and salary scale. Countries volunteering uniformed personnel to peacekeeping operations are reimbursed by the UN at a standard rate, approved by the General Assembly, of US$1,428 per soldier per month as of 1 July 2018. Police and other civilian personnel are paid from the peacekeeping budgets established for each operation. The UN also reimburses Member States for providing equipment, personnel and support services to military or police contingents. * All documents above are in PDF format.